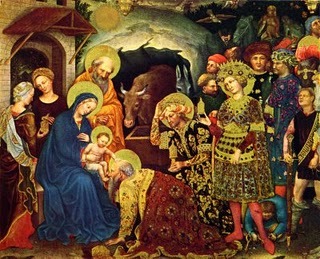 Today is the Feast of the Epiphany on the General Calendar of the Church. We celebrate God’s providence this day. He looked after the needs of the Holy Family, sending three strangers, Gentiles, bearing gifts and being the very first to proclaim Jesus Messiah and King. The story is old and familiar to us, yet it’s power and beauty reside in what was not said. Mary never asked the Angel, or God, how she was going to finance this little family. She never asked for her son to be seated on Herod’s throne, and for herself the honor and prestige of being Queen Mother. She never asked for the divine plan. None was offered. Mary didn’t get the divine plan up front. She was left to ponder so many events in her heart. God made her to be a model for us in faith. Faith that He would indeed make all things possible. Faith that He would call others to action on our behalf. Faith that His divine purpose cannot be thwarted by the evil of men. Who could have imagined that the long-awaited Messiah would have come as He did? Could Mary have imagined how her heart would be broken, as it was. Could Mary have imagined the ignominious fate of fleeing back to Egypt for safety from the Jewish King in the Promised Land? How terribly strange for the Messiah and His parents. Mary never complained, as did her ancestors in the desert. We do well to contemplate the example of Mary and share that in our pro-life witness, when so many parents want the assurances of a good life up front, with the baby’s life hanging in the balance. Like Mary and Joseph, Regina and I came to rely on the kindness and ministrations of strangers. For us it was in those strangers saving our son from autism’s ravages, strangers who materialized on the other end of the phone, literally out of the blue, prompted by the Holy Spirit. We learned how powerless we were on our own, but that with God, all things are possible. Like Mary, we didn’t get the divine plan up front. Like Mary, our hearts have been broken over our son. Like Mary, we’ve seen the power of God surround our son. Like Mary, we’ve been made to walk by faith, not by sight. Like Mary, we’ve pondered so many miraculous happenings in our hearts. Like Mary, we’ve proclaimed how our souls magnify the Lord, and our spirits rejoice in God, our Savior. “The human heart is not built in a day. It takes a lifetime to make a human heart. It takes all: birth and learning how to talk, making wishes, living with hope, dreaming dreams. The human heart is nourished with yearning for tomorrow, with poetry and devotion, with contemplation and the incessant thought of home. The human heart prays, it strives to find a faithful lover; it does not love until it dies in fidelity for the mystery of another life. “The human heart suffers, or else it does not grow; it exhausts itself or else it is empty; it waits and hopes, at dawn and dusk, in darkness and daylight. In waiting on the Lord, through trust in His Love and Mercy, Mary perfected her human heart. So on this night of the Epiphany, we sit contemplatively with Mary’s Immaculate Heart as we wait upon the Lord’s plan for our lives and ministry. I wonder about the trip to Egypt. The Gospel according to Luke says that after eight days, they circumcised the child, and when Mary had completed her purification, they brought him to Jerusalem (the center of Herod’s power), and there in the Temple Simeon recognized who and what the baby was (proclaiming it loudly, without any word getting to Herod), and after offering the appropriate sacrifices, the parents took the child into Galilee, to their own city in Nazareth. Luke doesn’t mention the wise men, nor does he say anything about Herod, or fleeing to Egypt. Luke does say that they did something very different. I don’t know any larger contradiction between any two passages in the Bible. I’m open to the possibility that both stories serve a purpose. I do wonder why all the learned church councils who decided which books to accept and which to leave out of the accepted canon never noticed this discrepancy. But, its a beautiful story, and you’ve done a marvelous job of telling it once again, fresh. Thank You. The gospel accounts can easily be reconciled. Recall that Herod orders the deaths of all males two and under. Exactly when the Magi arrived is not known, but could well have been some months after the birth. The Gospel writers were not concerned with the type of documentary detail that we are today. As the infancy narrative is recounted, the timeline may have been compressed in order to make the point more succinctly. Plausible, or maybe not. Please understand I am not raising this question to prove the Bible an irrelevant bunch of tribal myths, or to question the existence or majesty of God. I argue atheists to a stand-still on such questions all the time. But “Can be easily reconciled” is a suspect explanation by its very nature. The Gospel according to Luke says “Now his parents went to Jerusalem every year at the feast of the Passover, And when he was twelve years old they went up to Jerusalem after the custom of the feast…” (v. 41-42). That doesn’t sound like, after returning home, sometime in his first two years, they fled to Egypt, and never came near Jerusalem until Herod was dead. Matthew, meanwhile, is engaged in a dubious exercise of “that it might be fulfilled…” including the dubious “Out of Egypt have I called my son,” and even stranger, that upon return they went to Nazareth “that it might be fulfilled” the phrase “He shall be called a Nazarene.” It sounds as if the family never lived in Nazareth before, and moved there to fulfill a prophecy! I love manger scenes just as they are. I used to create them to the interior of the Christmas tree, against the trunk, when I was a child. If all the gospels were shown to be false, God would still be God. If Matthew turned out to have monkeyed with the account to create some poignant symbolism, “Verily I say unto you” would still be the words of Jesus, who would still be who and what he was and is. But I have doubts about the authority of each and every line of the text.